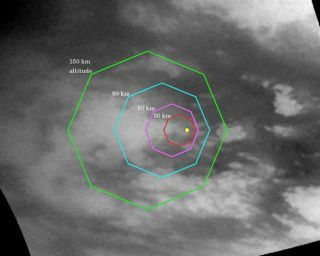 This map illustrates the planned imaging coverage for the NASA Descent Imager/Spectral Radiometer aboard ESA's Huygens probe during its descent toward Titan's surface on Jan. 14, 2005. The colored lines mark the observation area as the probe descends. The yellow dot is the planned landing zone. This story was last updated at 6:05 p.m. EST. A European probe has successfully landed on Saturn's moon Titan, a mysterious satellite that has perplexed astronomers for decades, with science data still streaming down to researchers on the ground. Built by the European Space Agency (ESA), the 705-pound (320-kilogram) Huygens probe landed on Titan between 7:45-7:46 a.m. EST (1245-1246 GMT) and delivered the scientific goods researchers were hoping for, beaming data home via NASA's Cassini orbiter. A full story on the landing, initial science return and first images from Huygens has been posted to the SPACE.com homepage and is available here . The live Huygens descent and landing commentary provided by ESA and NASA TV has concluded..
6:05 p.m. EST: After seven years in transit and 25 years in development, ESA's Huygens probe has fulfilled its mission to set down on Saturn's moon Titan and send data home. "The European Space Agency deserves a tremendous amount of credit," said Al Diaz, NASA's associate administrator of the Science Mission Directorate, earlier today while appearing to hold back tears during the announcement that Huygens sent data home. "There will only be [one] first successful landing on Titan, and this was it." While this concludes today's live commentary for the Huygens mission, in Darmstadt researchers and engineers continue to work through the night. A final wrap up of the Huygens mission is set to be broadcast on NASA TV beginning at 5 a.m. EST (1000 GMT) on Jan. 15, with a final news briefing scheduled for 12:00 p.m. EST (1700 GMT) the same day. Check for an updated final story to be posted on the SPACE.com homepage shortly. 5:41 p.m. EST: "With a single picture, we can start unlocking the secrets that we could only ponder with an orbiter," said JPL researcher Torrance Johnson, a Cassini imaging team member who lauded his counterparts with the Huygens mission. "Getting these pictures out as fast with [Huygens'] complex system is quite an achievement." 5:28 p.m. EST: Martin Tomasko, Huygens imaging instrument lead, said that initial studies of the probes Titan images have found that the darker regions once puzzled by astronomers appear to be smooth surfaces, while the brighter areas are elevated terrain. 5:00 p.m. EST: Huygens researchers are poring through hundreds of images and spectra data, and they will most likely work through the night studying the informational treasure sent home by the hardy probe, ESA commentators said. 3:00 p.m. EST: The first images of Titan have been pulled from Huygens data downlink to Earth. Martin Tomasko, lead scientist for Huygens' camera, said the probe has taken clear images after punching through the bottom of the moon's hazy cloud layer. Tomasko said researchers have currently pulled about 350 images of Titan's surface from the available data, revealing a wealth of textures and clear surface definition. 2:00 p.m. EST: Charles Elachi, director of NASA's Jet Propulsion Laboratory - which sent Huygens' Titan data to ESA's ESOC spacecraft operation center - said today that researchers may have the first images of Titan ready in about two hours. 1:30 p.m. EST: The Huygens probe performed its mission with flying colors, sending a near-complete set back to its creators by way of the Cassini orbiter. During today's post-landing briefing, ESA officials said the hardy probe not only successfully sent data home, but continued to live long past its expected lifetime. "We don't know if we are going to get to see the probe dying," Jean-Pierre Lebreton, Huygens mission manager for ESA, told reporters. Researchers are anticipating the first images of Titan - as seen by Huygens' onboard camera - to be available to the public some time in the next few hours. ESA mission commentary on the probe's descent and intial science data is expected to resume at 2:45 p.m. EST (1945 GMT). 11:40 a.m. EST: Huygens worked "beautifully" according to ESA Director-General Jean-Jacque Dordain. "The morning was good, the afternoon is better," Dordain said. "We have a scientific success." 11:35 a.m. EST: It's confirmed! Huygens has successfully returned science data from Titan's surface. The probe's landing is the farthest touchdown for any human-built object to set land on another world. A news briefing on Huygens' apparent success is underway and its thumbs-up all around for mission scientists and managers. 11:19 a.m. EST: Shouts and applause erupted from Huygens mission control, and presumably some data from the probe has apparently arrived. "We have it? We have it!" said one mission team member before the shouts. 11:15 a.m. EST: ESA officials had said earlier today that they anticipated the first science from Huygens at this time. So far, no word on the status of science data from the Titan probe. 11:12 a.m. EST: There is some discussion, from talk broadcast from ESOC's main control room, that it may be another seven minutes for the first Huygens data. 11:00 a.m. EST: ESA and NASA Huygens team members are still waiting to see the first data sent by the probe from Saturn's hazy moon Titan. At ESA's ESOC spacecraft operations center in Darmstadt, Germany, personnel are steadily gathering around computer consoles in anticipation. 10:35 a.m. EST: It's confirmed. Cassini has turned back to the Earth and is sending data. No Huygens probe data has been downloaded yet, but researchers are waiting expectantly. "We have 40 more minutes of suspense, then we'll know if everything worked properly," said John Dodsworth, Huygens ground manager at ESOC. 10:30 a.m. EST: Applause broke out briefly at ESA's ESOC spacecraft operations center in Darmstadt, Germany. Apparently, mission controllers have detected the first data from Cassini's Huygens receivers, spacecraft engineers said. That doesn't mean that any Huygens science has arrived, just that the receivers aboard Cassini designed to record that data were functioning at the start of the descent, they added. 10:15 a.m. EST: Huygens is still pounding out a signal to the surprise of ESA engineers, but any science data it is currently transmitting is falling on deaf ears. The Cassini orbiter, Huygens' only connection to Earth, has turned away from the probe and is preparing to relay the probe's data home, mission controllers said. "The probe has been living for more than five hours," said Huygens mission manager Jean-Pierre Lebreton. "But we knew at a certain time Cassini would have to stop recording." Lebreton said the Huygens science team is eager to see any science data, but can wait. After all, they've waited more than seven years -Cassini-Huygens launched in 1997 - just to reach this point in the mission, he added. 10:00 a.m. EST: Engineers at JPL said that although Huygens' data will first be received at JPL, it will be forwarded straight to ESA's ESOC spacecraft operations center in Germany where hundreds of scientists and engineers are eagerly awaiting news from the Titan probe. 9:50 a.m. EST: As ESA commentators take a break in Darmstadt, Germany, researchers and engineers at NASA's Jet Propulsion Laboratory in Pasadena, California are lauding Huygens' apparently successful landing on Titan. "There are a lot of excited people in Darmstadt and here too," said ESA Huygens system engineer Shaun Standley at JPL. 9:45 a.m. EST: By 10 a.m. EST, mission managers expect Cassini to have begun to swing back to point toward Earth and deliver the first packets of information from the Huygens probe on Titan. 9:20 a.m. EST: NASA's Cassini orbiter has a quadruple redundant data recording capability, meaning the spacecraft is collecting Huygens data with four redundant systems in hopes of ensuring that no information is lost, ESA officials said. "We really don't want to lose any bit of this precious data," ESA mission operations manager Claudio Solazzo said earlier today. 9:10 a.m. EST: "The probe is still alive and sending a signal," said Claudio Solazzo, ESA Huygens mission operations manager. Now that Huygens is apparently on Titan, researchers hope a pair of electronic levels will register any movement of the probe. If it landed on a hydrocarbon lake, the levels would detect any bobbing motion, researchers have said. A penetrating instrument on Huygens' bottom should make a very simple measurement upon landing to determine if the landing zone is firm, clay, sand or other type of surface, Huygens mission scientists said. 8:35 a.m. EST: Huygens mission controllers report that the probe landed somewhere between 1:45 p.m. and 1:46 p.m. local time in Darmstadt, Germany (CET), that's somewhere between 7:45 a.m. and 7:46 a.m. EST. The probe is apparently on Titan's surface and still going strong, mission managers said. 8:00 a.m. EST: The first Huygens news briefing post-Titan descent has concluded. ESA mission managers said Huygens' carrier signal, the only signal researchers expected to detect from Earth, has also been detected by the Parkes radio telescope in Australia. The signal has been blaring strong for two hours now, researchers said. Mission manager Jean-Pierre Lebreton said that four optical telescopes around the world were trained on Titan during Huygens' descent. One telescope was unable to observe the event due to poor weather, while the other three failed to detect any sign of a entry fireball, he added. The first real telemetry from Huygens should reach Earth around 10:21 a.m. EST (1521 GMT), though it will be 4:21 p.m. local time at ESOC in Darmstadt, Germany. The first science data is anticipated to arrive by 11:15 a.m. EST (1615 GMT), mission controllers said. 7:45 a.m. EST: At least one instrument aboard Huygens is taking data. A Doppler instrument designed to track wind patterns on Titan is apparently working, Jean-Pierre Lebreton, Huygens mission manager, said during the press conference. 7:20 a.m. EST: The first news briefing on today's Huygens descent to Titan should begin in about 10 minutes at ESA's ESOC spacecraft operations center. Huygens reached Titan successfully about two hours ago, and should have touching down on the moon's surface at 7:34 a.m. EST according to a NASA mission timeline. 6:45 a.m. EST: ESA officials say the mood at ESOC has eased with the Huygens signal detection by West Virginia's Green Bank Telescope. Nail-biting tension has been replaced with some relief, though Huygens mission scientists are still eager to learn if their science instruments are taking measurements as designed. "We're now just waiting for Cassini," John Dodsworth said earlier. 6:15 a.m. EST:With the confirmation signal from Huygens in hand, ESA officials know the probe is currently floating down toward Titan under its main parachute. It will jettison the parachute as it descends and deploy a smaller, three-meter parachute in order to reach the surface before onboard batteries run out, mission managers said today. June 30, 2004: BOULDER, COLORADO --After a nearly seven year journey, the spacecraft swung into an orbit around the giant gas globe tonight, ready to spend the next four years performing scientific investigations of the Saturnian system. Learn more about the Cassini-Huygens project with these video journey behind the mission. DARMSTADT, Germany-- A network of powerful ground telescopes has picked up the signal of Europe's Huygens descent probe 1.2 billion kilometers away, confirming that the probe is alive as it begins its descent into the thick atmosphere of Saturn's largest moon, Titan. European Space Agency officials at Huygens mission control here said the signal -- no more than the equivalent of a telephone dial tone -- was detected by a network of 18 telescopes deployed to listen for a signal coming directly from Huygens. The biggest of these antennas is the 100-meter-diameter Robert C.
Byrd Green Bank Telescope, operated by the National Radio Astronomy Observatory in Green Bank, West Virginia. The signal did not confirm anything beyond the fact that Huygens is alive. But it was enough to cause a burst of applause here when announced at 5:35 a.m. EST (10:35 a.m. GMT) today. 'There is a lot of emotion in this room," said Jean-Pierre Lebreton, Huygens program manager at ESA. "It's great news." Leonid Gurvitz, mission manager for Huygens' communications with the ground telescope network, said 18 telescopes including Green Bank had been trained to pick up a signal and that it is the network itself, more than any single telescope, that received the Huygens signal. NASA's Cassini satellite, which carried Huygens to Saturn orbit, has been moved into position to receive Huygens mission data during the probe's 2.5-hour descent into Huygens' thick atmosphere. A more-complete assessment of whether Huygens' parachutes have deployed and its heat shield jettisoned to permit the start of observations is expected to be received by science teams from Cassini around 11:20 a.m. EST (1620 GMT) today. 6:00 a.m. EST: If it switched on as planned, a microphone instrument aboard Huygens may allow researchers to recreate the sound of the probe's descent as it plunged through Titan's atmosphere, ESA mission scientists said. The instrument may also record thunder, and Huygens scientists hope to have at least initial data to present within 24 hours. 5:50 a.m. EST: Cautious ESA commentators stress the Huygens signal is just a carrier tone. There is no confirmation that the six science instruments aboard the probe are working as planned. "It looks like we heard the baby crying," said Huygens mission manager Jean-Pierre Lebreton from the floor of ESOC mission control. "But clearly it tells us the probe is alive, the entry has been successful and we are under parachutes." 5:35 a.m. EST: Huygens speaks from Titan! ESA has confirmed that the Green Bank Telescope successfully detected a Huygens signal tone. The signal, a confirmation that Huygen's transmitter is at least functioning, and activated on time at about 5:18 a.m. EST. About 600 people are at ESOC mission control for Huygens Titan descent and some engineers crowded around computer monitors when the signal confirmation was announced. "It's a tremendously exciting moment," said John Dodsworth, Huygens ground manager at ESOC. 5:30 a.m. EST: If everything is going well, researchers may be able to assemble Huygens first pictures of Titan within 24 hours, U.S. astronomer Martin Tomakso, the international lead of the probe's only optical instrument, has said. "The first images may be pretty murky," Tomasko said from Darmstadt, adding that Titan's nitrogen-rich atmosphere is quite hazy. "But we think the haze has a bottom, and that once we get through it we'll have a clear view of the surface." Tomasko said that during its slow descent, Huygens will most likely be swinging and rocking while taking numerous images that will later have to be assembled into mosaics. The Sun should appear 10 times smaller from Titan than it does from Earth, so researchers expect a sort of twilight environment, he added. 5:15 a.m. EST: According to its timeline, Huygens should now be transmitting data to its Cassini mothership, after deploying a series of parachutes to slow its descent. The first few measurements could already be in Cassini's data file, researchers say. But they will not know for sure whether Huygens transmitter is working unless Green Bank is successful in picking up the tone, or from Cassini once it turns back toward Earth. 5:00 a.m. EST: ESA's Huygens probe is scheduled to reach Titan in the next few minutes. While all Huygens data will be recorded by Cassini for later playback to Earth, astronomers are hoping that the powerful 100 by 110-meter Green Bank radio telescope in West Virginia will pick up a simple tone from the probe. 4:15 a.m. EST: Al Diaz, NASA's associate administrator of the Science Mission Directorate, is monitoring the joint Cassini-Huygens operations at ESA's ESOC mission control center in Darmstadt. "It's a mission unlike anything we've tried before," he said today of Cassini-Huygens. 4:00 a.m. EST: ESA is providing a real time tracking of Cassini and Huygens. You can see find it here. At last report, Huygens was set to reach Titan at about 5:05 a.m. EST, then deploy parachutes a few minutes later. The Cassini orbiter was last reported about 72,000 kilometers from Titan. It has turned away from Earth to record any data Huygens is able to broadcast. 3:30 a.m. EST: ESA mission controllers are playing a waiting game now with Huygens' mothership Cassini. The NASA orbiter has apparently turned away from Earth and is oriented toward Titan to receive data fromthe Huygens probe. European commentators have their fingers crossed that Huygens' descent goes better than a recent - but fictional - probe to Titan in the BBC science fiction series Space Odyssey. In that series, which follows a crew of astronauts exploring the solar system, an automated Titan probe fails after deployement. 3:25 a.m. EST: Huygens mission controllers report the probe is hurtling toward Titan at about 22,000 kilometers an hour. 3:20 a.m. EST: John Dodsworth, of ESA's ESOC mission control center at Darmstadt, said Huygens is about two hours from reaching Titan interface - about 1,270 kilometers above the surface. The probe is right on target and will land well within its target, he added. 3 a.m. EST: ESA officials are counting down to the Huygens probe's arrival at Titan. The probe is still a few hours off from encountering the moon's atmosphere. "I certainly am jumping all over in anticipation," said Claudio Solazzo, ESA Huygens Mission operations manager, from Darmstadt, Germany. "Today is a great day."